Perhaps in an effort to stir the pot so to speak, Corey at 10,000 Birds raised an interesting question a few days ago: Can Creationists Be Birders? The short answer is “Of course!” For most birders, the appreciation of birds does not extend much beyond the aesthetic beauty of the birds and the ability to match a bird with a name. That may be sufficient for some people just as knowing the names of their co-workers and acquaintances is sufficient, but when they’re finished, they know very little about the birds (or persons) themselves. If you dig a layer deeper, a person can learn about the reproductive cycles and diets of the birds they watch. A person can also learn the geographical ranges of the birds that he or she knows. Or the quirky behaviors, flight styles, and habitat proclivities of those birds. Or all of the subtle hints that go into what birders call General Indicators of Size and Shape (GISS), which is often extended to include not just size and shape but any clue at all that can be used to distinguish what group or species of bird that may you glimpse. First, the body of knowledge that has since formed the evidence for evolution was collected by creationists first and foremost. Creationism was still considered mainstream science during this golden age of studying taxonomy and morphology. Linnaeus, certainly no evolutionist, established the system of scientific classification that we use today, and his groupings were based upon shared physical characteristics. Only his groupings for animals remain to this day, and the groupings themselves have been significantly changed since Linnaeus’ conception, as have the principles behind them. Nevertheless, Linnaeus is credited with establishing the idea of a hierarchical structure of classification which is based upon observable characteristics — something that is entirely compatible with both the concepts of special creation and speciation. Even Charles Lyell, who established a much older age for the Earth and paved the way for gradualism, had defended the thesis of “Centers of Creation.” These Centers offered a convenient argument for not only the periodic appearance of new species in the fossil record but also the observable differences between the floura and fauna of the continents, without really explaining how they got there. So, not only taxonomy but the observations of morphology and paleontology are compatible with either hierarchical organization of Earth’s flora and fauna. When I recollect the fact that [from] the form of the body, shape of scales and general size, the Spaniards can at once pronounce from which island any tortoise may have been brought; when I see these islands in sight of each other and possessed of but a scanty stock of animals, tenanted by these birds, but slightly differing in structure and filling the same place in nature; I must suspect they are only varieties. The only fact of a similar kind of which I am aware, is the constant asserted difference between the wolf-like fox of East and West Falkland Islands. If there is the slightest foundation for these remarks, the zoology of archipelagoes will be well worth examining; for such facts would undermine the stability of species. 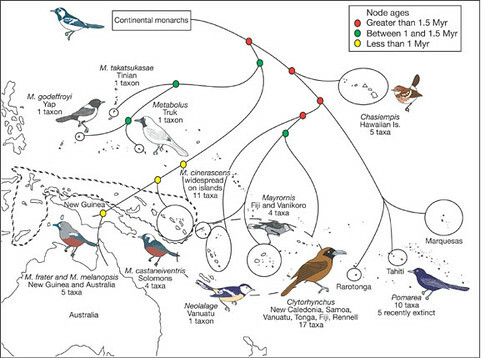 So it was here, with this odd distribution of mockingbirds (as well as a few other details of island biogeography), that Darwin first thought that Lyell’s hypothesis of centers of creation and its principle conclusion – the fixity of species – had been undermined. He also later learned that many of the other birds that he thought to be wrens, warblers, etc., were in fact finches which provided the possibility of common ancestry between seemingly unrelated “kinds.” This is the case for a variety of phylogenies, such as the honeycreepers shown in the image below – an impressive display of diversity from a strange collection of birds that appear unrelated, but bear strong resemblances to one another upon closer inspection, that betray their common ancestry. Clade-specific morphological diversification and adaptive radiation in Hawaiian songbirds, by Irby J Lovette, Eldredge Bermingham, and Robert E Ricklefs. (2001) Proceedings of the Royal Society of London: Biological Sciences 269:37-42. 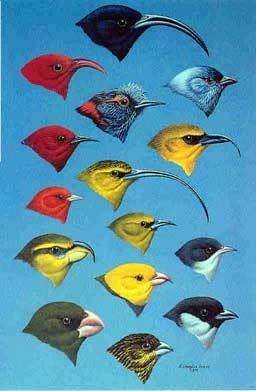 Hawaiian honeycreepers radiated from an ancestral founder that was a cardueline finch. The most knowledgeable birders will recognize the radiative diversification of families and genera on the continental mainlands of the world as well. The biogeographical distributions are usually more overlapping, and thus the process of speciation less clear, but it is still there as evident with cryptic species and other species group patterns. Even for passive birders in Europe and North America who do little more than watching the visitors at their feeders, there are the Carduelis finches to consider. Do they not watch the goldfinches, greenfinches, siskins, chaffinches and linnets and think that they are sister species? Simply knowing that they reproduce and may change as individual species over successive generations – monophyletic change – it is readily apparent that if two populations within a species stop interbreeding, that they will diverge and eventually become separate species. Over time, they may diverge so much as to be unrecognizable as belonging to the same genus, or family even. 1. How do you comprehend the ongoing debates in ornithology over adaptive “niche-filling” and geographical separation for the origins of new species? Since Mayr’s 1942 book Systematics and the Origin of Species, there has been an ongoing debate in biology over speciation. That is, is natural selection and an empty “niche” sufficient for a new species to emerge, or do you need geographical isolation to allow for genetic drift? Most biologists tend to think the latter, because natural selection does not select for reproductive isolation, which is required for the species to remain distinct. The study of the Geospiza group of Galapagos ground finches (aka Darwin’s finches) is perhaps the best study of adaptive speciation. Ongoing since 1973, Peter and Rosemary Grant have been trekking to the Galapagos island of Daphne to track the fluctuations of disruptive selection and hybridization, and the outcome of the studies leaves a reader with the ambiguous nature of adaptive speciation. See the book Evolution on Islands and chapter 9 in particular for more on this subject (Amazon US/UK). 2. How do you understand why we say that the best places for seeing a diverse group of new birds (for the observer) is on remote islands and archipelagos? And finally, if you deny that speciation occurs, how do you follow the debates over whether separate populations of birds are the same or separate species? The ornithologists will be speaking from completely different theoretical arguments than any creationist, effectively shutting out creationists from the discussion. The creationist can certainly identify a bird from his or her field guide just as well as an evolutionist, and appreciate its appearance and behavior, but they’re missing details regarding the origins and diversity of those birds that inform the rest of us. I’m a 6 day creationist, and I really enjoy reading anything in the sciences, and recently got interested in birding, although I’ll just observe them (the birders) from the side lines. Nice people. Knowing the origin of everything makes it so much more interesting. Interesting post, but slightly misinformed. Fixity of species is not a creationist belief. (There may be a few creationists who think that, just as there are a few evolutionists who believe in, say, panspermia…) Creationists who study biology have no problem with speciation, they just don’t believe that all animals have common ancestry (phylogenetic discontinuity). The development of species, genera, etc., is one of the principle areas of study (sometimes called baraminology) within creationism right now. CreationBiology.org has an overview of the subject. Both times I compare speciation directly with creationism in this post I am very specific in addressing the concept of special creation. And… from the perspective of “phylogenetic discontinuity” that you mention — that is little more than the “centers of creation” that I mentioned in the paragraph along with Lyell and which were found to be terrible explanations of biogeography by Darwin and Wallace. Apparently I glossed over that too briefly. Thanks again for the comment, I added a small bit to fill in the bit I glossed over. I agree I had missed that. This is why we shouldn’t believe everything we read on Wikipedia, heh. Special Creation does not infer that every species was created individually. Unfortunately, for whatever reason, writers sometimes confound what creationists do or do not believe. Even then, there are as many different kinds of creationists, even “special” creationists, as there are evolutionists, so it is difficult to make blanket statements in any case. For (“special”) creationists (including those from groups like AiG, ICR, CRS, CMI, etc.) who go by a literal reading of Scripture (there’s actually a more accurate term for this than “literal,” but that’s a different subject), we understand that the word species does not appear in Genesis. Instead, it says that every “kind” had young after its own kind. Kind does not equate with species, but is a larger grouping. (This can be determined by looking at the dietary laws of clean/unclean animal kinds given to Israel in Leviticus. Obviously, species are too small a grouping for what is noted.) So, there is no reason for a creationist to believe that speciation (or higher differentiations) cannot occur. The idea of fixity of species didn’t start with religious institutions, anyway — it emerged from the Aristotelian “great chain of being” concept. The medieval church, unfortunately, took on a number of early Greek ideas and tried to fit them into Western religion. Phylogenetic discontinuity means that there is no common ancestry of all species. Instead of a single global “bush of life” (as evolutionists suggest), there are multiple global “bushes of life” where differentiation (including speciation) has occurred over a period of time throughout the planet. This is a very different concept from “centers of creation,” where certain types were suggested to have been created in different parts of the world at different times. In other words, under phylogenetic discontinuity, all owls had a common ancestor and differentiated through natural selection, etc., as they occupied new niches, and underwent other ecological and biogeographical processes. Under the “centers of creation” concept, different owls at different times in different lands were created. That isn’t what modern creationists believe (even in the past, that was primarily an argument put forward by individuals who held to deep time and a non-literal Genesis, but still found themselves arguing against Darwin on principle). So, the gist is that the primary points of difference between an evolutionist and a young-earth creationist would be a) deep time vs 6-10,000 years, b) uniformitarian geological processes vs a global catastrophic deluge event, and c) common ancestry of all organisms vs phylogenetic discontinuity. Believe it or not, there are professional ornithologists who are creationists. Years ago, I talked to a PhD who worked out of Louisiana State University’s Museum of Natural Science who was a creationist. I think his focus was on South American birds. Special Creation does not infer that every species was created individually. Phylogenetic discontinuity means that there is no common ancestry of all species. Evolution vs. Creationism: An Introduction, by Eugenie C. Scott. It’s quite a fascinating read. Wow, Dan. For a little while there, I thought this might be an interesting discussion where, if we don’t agree on the interpretation of evidence, we could at least agree not to misconstrue the other side. I was not nit-picking when I corrected your mistake. Clearly, “creation of a biological organism de novo is not only possible but has happened often throughout natural history” is not a creationist claim. The “de novo” event happened once, not “thoughout natural history.” I’m not sure where you came up with that one. I don’t particularly care whether you believe in God or not, but I do, which means that I have a rational mechanism, whether or not scientific, for the beginning of the universe and life itself. 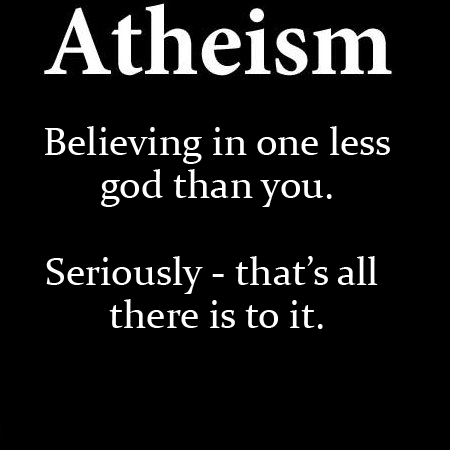 Nontheists are still working on that. “Extraordinary claims require extraordinary evidence.” Apparently, you don’t read your skeptical literature. Even this statement has run into flack. A better statement would be “Extraordinary claims require sufficient evidence.” So, while “microevolutionary” mechanisms are recognized for speciation by both evolutionists and creationists, the evolutionary claims for greater changes (e.g., invertebrate to vertebrate, reptile to bird, etc.) are extraordinary claims that lack, to the creationist’s mind, sufficient evidence. You may disagree, but you’re not going to change anyone’s mind by creating straw man arguments. In any case, as noted previously, my real interest in your article was to point out that your conclusions regarding what creationists believe about speciation were incorrect. You appear to be ignoring that, but I guess since we are the “enemy,” it doesn’t matter what you print about us. Don’t worry, I won’t bother you again on this. I just hope that you come to realize that we really aren’t the enemy, and that we do, in fact, appreciate the natural world and its (proven) processes as much as you do. The unproven theoretical areas really aren’t worth the antagonism too often engendered. Clearly, “creation of a biological organism de novo is not only possible but has happened often throughout natural history” is not a creationist claim. The “de novo” event happened once, not “thoughout natural history.” I’m not sure where you came up with that one. Instead of a single global “bush of life” (as evolutionists suggest), there are multiple global “bushes of life” where differentiation (including speciation) has occurred over a period of time throughout the planet. This is a very different concept from “centers of creation,” where certain types were suggested to have been created in different parts of the world at different times. Do you accept universal common ancestry or not? If you accept it, then I’m not sure what you’ve been arguing with me for. I tend to assume that a person’s first response is more indicative of his or her true position though, so maybe you were just now experiencing a moment of cognitive dissonance. I’m not misconstruing you, you’re doing it to yourself — You can’t argue against something one moment and for it the next without conceding the point. Well, this is an alternative to Lyell’s “centers of creation,” that’s true. It is also very strange… why argue that owls as a taxon are unrelated from other birds when the dinosaur/theropod origin of birds is apparent? It’s ridiculous. The question isn’t whether owls are related to other birds at all – it’s whether they’re more closely related to nightjars or to the diurnal raptors. I also have a quibble about what creationists believe… despite Chad’s assertions, biblical literalists such as Norma above do in fact represent mainstream creationism. About 45% of Americans believe that the Earth was created 6-10,000 years ago with species in their current form, and the more “liberal” brands of Christianity, along with Old Earth Creationism, are the ones losing followers. The evangelical/conservative sects of Christianity which espouse the fixity of species and reject much of modern science are growing meanwhile. So whatever Chad thinks most creationists believe, it would seem that he’s wrong.